Forum Index > Makers and Manufacturers Talk > Spear of the warrior burial. Posted: Sat 28 Sep, 2013 11:00 am Post subject: Spear of the warrior burial. 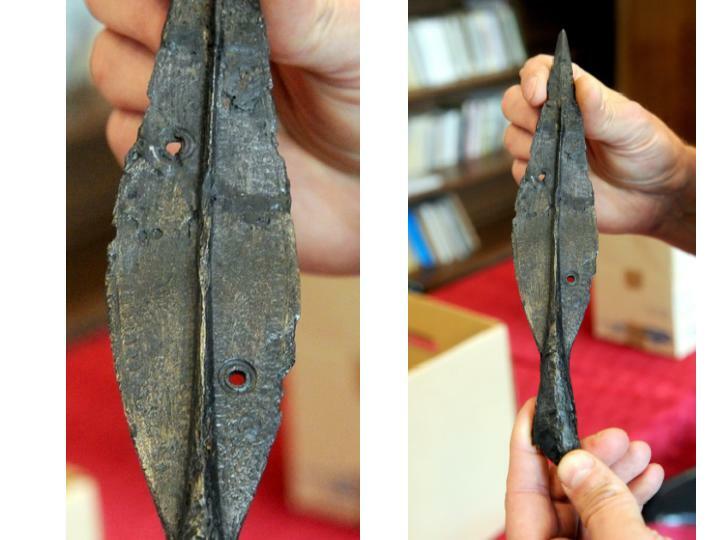 In Poland, Czelkin found in burials of warriors dating from the I BC - III AD, among other artifacts was this beautiful spearhead. As you can see in the picture has the two holes around which is an oval ring. I wonder if the holes are the inlays (bronze, silver, gold), which is not what remained of reasons. Ring-dot decorations of this type is not uncommon in the Danish bog finds. I would guess that there was originally an inlay of silver or copper alloy in this spear head. Why the metal of the inlay is no longer present, I don´t know. If it is a fire burial, it might have melted out? Or perhaps it wss removed for some reason before being interred in the burial? silver or gold i see melting out if burned, but copper? i think a fire hot enough to melt copper would leave nothing of the iron behind. I'd want to believe that if these were some kind of precious metal, someone pinched them with a five finger discount. When I see that, I'm reminded of these, so my guess will be silver. i am a newbie here but i seem to recall a discussion on another forum about arrow heads with a hole in them to make noise maybe this one is something like that? i have heard about the whistling arrows before as well, Chinese. they were more of a command signal. arrows were made with distinctive whistles to command troops to attack targets - withdraw - and other actions. a commander could watch the battle and if he desired shot an arrow over his troops to give a command rather than dispatch someone to give verbal orders to them, costing time. this is probably something more ceremonial pictured here. and the chances of these holes being filled with an inlay material seems like the most probable answer to why they are made with hole in them. a silver rod may have gone through the center - and the channel was filled with a ring. They also used whistling crossbow bolts, called bremsen, in the Baltic area and in Poland. I'd be surprised if it was merely in the Baltic/Poland area as "Bremsen" is a fairly common German word for a gadfly (or "brakes"...although a stinging buzzing fly seems more probable). I'd expect a regional vernacular term if it was that localized. Do you have any further details, or a source? I wonder if there was a smith making spear blades, who was well into a project when he noticed there was a thin spot or inclusion or something in the middle of the blade. Thinking fast, he turned the flaw into a hole, and then made a symmetrical or complimentary hole on the other side of the spine. The local chief wanted a spear with some kind of unique mark, because every warrior in his band had a spear and he wanted to stand out. "Holes!" he said. "This is a good spear and I've never seen holes in a spear before! I will show this spear to everyone I meet and they will think it is fashionable because I am a successful war chief." even though i do like this, i don't think it would be the case. master craftsman always seem to have a reason for making something in the way in which they do - if this was a master craftsman at work here. the big chief that commissioned this from his smith might be pretty &*^#ed off if he came in to pick up a spear head with holes in it. "hey what the #$&% is this!?!? you give me a spear with holes in it? the guys are gonna say i got a wimpy spear - what am i gonna do whistle through them at my foe? hurry up and plug up those holes with something."